전문분야 경력:11년, 비기너&주니어에 강함, 집중력 있게 수업 진행, 학생의 이야기를 잘 듣고 바른 문장으로 이끔, 친구같은 편안함, 차분한 강사님! 꼼꼼한 교정과 친절한 수업으로 베스트 티쳐상을 두번이나 수상하셨습니다. 처음 Veni강사님이 수업하는 것을 보았을 때를 잊을 수 없습니다. 모니터에 거의 빨려 들어가다시피 굉장히 집중해서 수업을 하시는 것이 아직도 생생하네요. Veni강사님의 가장 큰 장점은 집중력입니다. 학생이 무엇을 이야기하려 하는지 열심히 듣고 바른 문장으로 이끌어 주십니다. 또한 타고난 착한 성격으로 아무리 엉뚱한 이야기를 해도 끝까지 참고 들어주시고 좋은 문장을 반복해서 말씀해주시기 때문에 비기너 또는 주니어 수업에 적극 추천해드립니다. Hi there! This is teacher Veni of ENTOR ENGLISH. 안녕하세요! 저는 엔토영어의 베니 강사입니다. I am 25 years old and I’ve been teaching English language for almost 3 years now. 저는 25살이고 영어 가르친 경력은 이제 3년이 다 돼가네요. I know that learning to communicate in another language can be very difficult and frustrating at times. 다른 언어로 의사소통을 배운다는 것이 매우 어렵다는 것을 저도 잘 알아요. But, it can also be one of the most re warding experiences of your life, being able to communicate in another language will open doors for you to experience the world of new people, places and ideas. 그러나 한편으로는 다른 언어로 대화를 나누는 것은 새로운 사람, 장소, 아이디어 등의 새로운 세계를 경험 할수 있는 가장 보람 있는 경험이 될 수도 있어요. However, be sure you are confident of your speaking listening and writing skills since you might be dealing with people from all over the world, who may not have the same accent and who will speak quickly and use idiomatic speech. 하지만 다른 억양 및 빠른 사투리를 사용하는 세계 각지의 사람들과 대화를 해야 할 수 있으므로 당신의 말하기, 듣기, 쓰기 능력을 확실히 갖추세요. English language skills are your passport to a global career. 영어 실력은 곧 당신의 세계적인 커리어를 돕는 핵심 키입니다. That is why Entor is open to students who are willing to learn English. 그것이 바로 엔토에서 영어를 배우고자 하는 이들에게 열려있는 이유기도 하고요. So, whether you want to study English for travel, work to prepare for further study or just want to have fun. ENTOR can be a big help for you! 당신의 영어 공부 목적이 여행 혹은 업무이든 공부 또는 단순 재미이든 엔토영어은 당신의 큰 도움이 될것입니다! 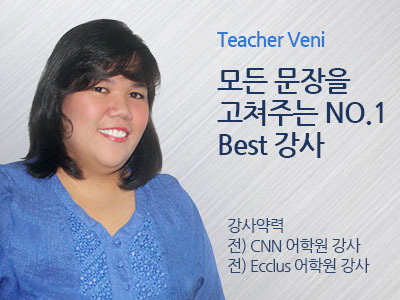 Once again, this is teacher Veni and I am looking forward to be part of your learning. See you! Have a wonderful day! 다시 한번 저는 베니였고 당신의 선생님이 되기를 진심으로 바래요! 그럼 모두 즐거운 하루 보내세요!